Based on Bill O’Reilly and Martin Dugard’s best seller comes this shocking thriller starring Rob Lowe and Ginnifer Goodwin. As John F. Kennedy (Lowe) rises to become U.S. president, a former Marine grows disillusioned with America. When their paths ultimately cross, the course of history is changed forever as seen in this mesmerizing film about the assassination of JFK — and its chilling aftermath. 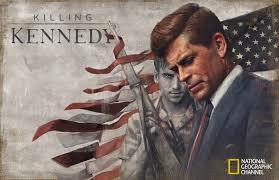 “Killing Kennedy” is an intriguing, compelling and strongly acted 90 minute docu-drama about the history of both Lee Harvey Oswald and President John F. Kennedy leading up to that fateful day in November of 1963. The film, directed by the ever busy TV director Nelson McCormick (Longmire, The Stepfather, Touch), was produced by Scott Free productions and aired on National Geographic earlier this month. 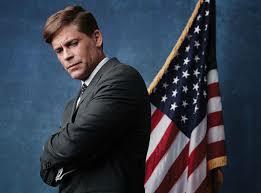 The movie stars Rob Lowe (Salem’s Lot) as JFK, Will Rothhar (CSI, Battle: Los Angeles) as Lee Harvey Oswald. 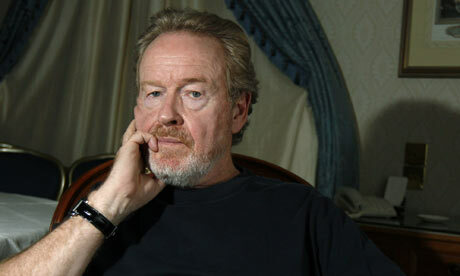 The movie is based on the novel by Bill O’ Reilly and Martin Dugard. The movie utilizes the strong cast to incredible effect. 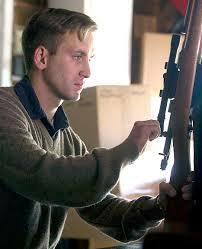 McCormick directs his actors with an amazing precision and it is the one thing in the film that is a solid constant. McCormick and writers O’Reilly and Kelly Masterson (Before The Devil Knows You’re Dead) tell the tale of these 2 iconic men in a linear and parallel timeline. What is refreshing about this production is that the story deviatesi (or maybe shuns?) the wild and kooky theorizing in order to provide a more straight forward version using facts and archival info to inform us. 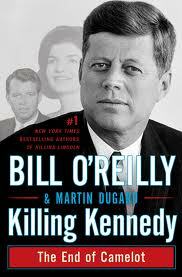 It is earnest in it’s depictions of how Oswald and JFK are fated to have their destinies intertwine in history. The movie, in fact, (with it’s beautifully lush tones for the sequences with JFK and the harsh blues and shadows for Oswald’s) is a traditional drama about isolation, warped ideologies, political theater and tragedy. McCormick’s film is robust with short vignettes about the 4 years prior to JFK’s murder, often switching from Oswald to JFK during this period. Rothhar’s Oswald is incredible to watch. Oswald, here, is fanatical, un-appreciative, paranoid and a completely evil figure with nary a shade of grey in the the whole scheme. Rothhar makes Oswald a nervous, impulsive and duplicitous type will great skill. Oswald is always obsessive, misconceived and angry. Rothhar allows Oswald to grow during the movie into a indecisive sociopath who cannot maintain any semblance of a normal life because of his edgy and frustrated ideologies. 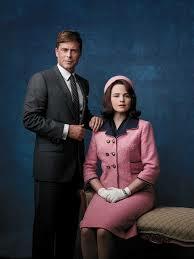 Rob Lowe’s JFK is a different matter altogether. As you watch the film unfold, one comes to the conclusion that Oswald is the meat and potatoes of the movie. 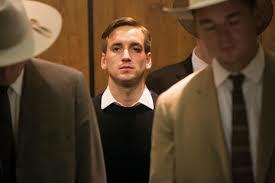 Much more time is spent on watching the life of Oswald, his wife and children, unravel around them. We are witness to many of the pivotal moments that Oswald was a part of like his defection to Russia, his return to the states and various interviews with the CIA and FBI. As almost the anti-thesis. JFK’s dramatic re-creations are like small doses of history and drama together in the mix. 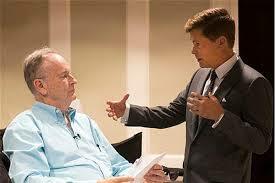 The movie follows the book closely with small insights into the pain, drive and convictions of JFK. Lowe does an amazing job here, adding levels of complexities and melodrama. We watch him as he gets his daily pain and steroid injections for his back, all the while trying to solve a crisis regarding the Russians. And while “Thirteen Days” is the seminal film to watch about the Cuban Missile Crisis, “Killing Kennedy” does a fine job covering the event that defined JFK’s term in office. As we peek ever more into his life we that he plays with his children, campaigns and even consoles Jackie after her latest miscarriage. Lowe’s JFK is an emotionally earnest but quiet lamb amongst wolves. While the details of these scenarios (especially the political showmanship) are a bit glossed over, we still get accurate and believable moments of clarity which makes the film even more enjoyable and informative. Lowe holds his own here despite being overshadowed by others in the cast. He nails JFK brilliantly. Accent, mannerisms and even in looks. 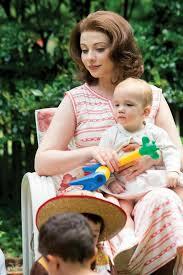 Michelle Trachtenberg as Marina Oswald is probably the strongest performance in the film next to Rothhar’s. She is emotionally charged and remains a tragic figure of sorts while she tries to understand Lee Harvey and why he does the things he does. 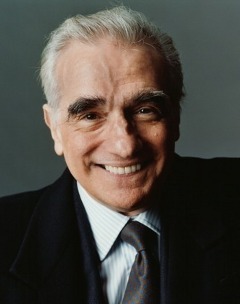 Trachtenberg adds depth to Marina, who in so many other films is reduced to a background character. Here, she is a larger player in the history that unfolds. Her portrayal gets better and better the more she has to fight with herself to remain a caring mother and dutiful wife to Oswald. One particular scene that impressed me was how she had to admit to the FBI that Oswald did indeed own a rifle and had to lead them to the garage. In this moment of clarity for Marina, Trachtenberg floored me with her incredibly powerful achievement in that scene as she realizes the truth. 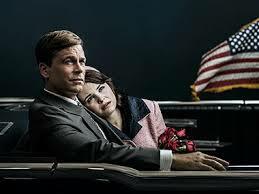 Ginnifer Goodwin as Jackie is also wonderful to watch as she is almost in the same boat with Marina while dealing with her tribulations backing JFK all the while having to turn a blind eye (we don’t really know if this happened or not) to JFK’s indiscretion with women. One that even had ties to a Mob boss. 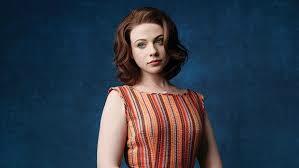 She is quite capable and carries the elegance and maturity of Jackie very well. One scene, where she refuses to take off the blood spattered pink dress is an emotional powder keg of a scene and Goodwin manages to knock it out of the park. Jack Noseworthy (U-571, Breakdown, Event Horizon) as Booby Kennedy is fantastic. His reaction to hearing about his brother’s death raised the hairs on my arms. Noseworthy’s Bobby is a protective and handsome person and he gives Bobby a powerful essence that even JFK reveres in this movie. But in the end, it is Oswald’s show and when Jack Ruby (Casey Siemaszko) shows up we know Oswald’s end is near and the film deftly handles the aftermath, (including the murder of Officer J.D. Tippit by Oswald) confusion and mayhem that the assassination created and spurred. McCormick uses real life news breaks, interviews and footage to blend in well with the re-creations. 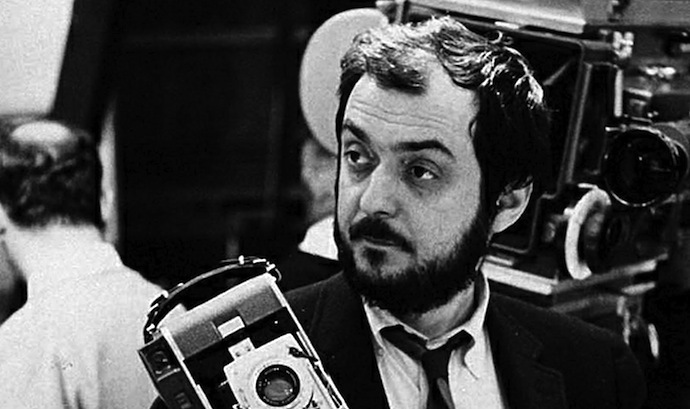 The film is a point by point narrative that reveals people, places and things with great respect and force. 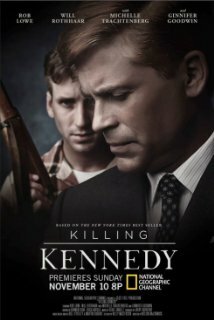 For a 90 minute film, I was very surprised how much was covered and how dramatic and captivating “Killing Kennedy” was. It is not a movie for conspiracy theory pundits but for those who feel that a simpler drama unfolded all those years ago that was more or less a black and white affair. The film feels much like a companion piece to The Warren Commission’s opus at times but it is not such a bad thing. And whether or not you agree with any of it, “Killing Kennedy” is worth your time for the strength of the narrative and the incredibly dynamic performances. Recommended! What an amazing film on a controversial time in history. I may check it out! It’s pretty good, Maurice. My only complaint would be that much more focus was on Oswald and very little on JFK but do not let that prevent you from watching. It is a very compelling production.